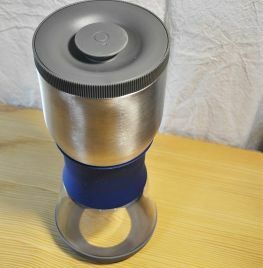 The Fellow Duo Steeper is an innovative design of coffee maker to help give greater control over your coffee brew process. The Duo is an immersion brew coffee maker which enables the water and coffee to mingle for your desired brew recipe. 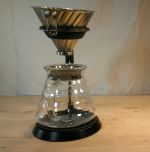 An upper stainless steel brew chamber facilitates the brewing process allowing the coffee to be immersed in the hot water. 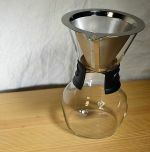 When your brew time is complete, simply twist the top to allow the water to flow through to the borosillicate glass carafe below in a matter of seconds. You can retwist, to keep your brew warm, and then open again when you're ready to serve. 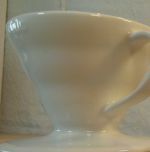 A pour channel opens up allowing the coffee to pass directly from the lower chamber and out through the spout. The Fellow Duo Steeper comes with a blue silicone grip. Sillicone parts on the base and the grip protect the Fellow Duo Steeper and your hands when serving! 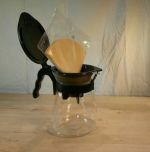 The Fellow Duo promised the intensity of a French Press with the crispness of a pour-over due to its innovative design, which allows the coffee to be separated from the coffee grounds immediately once your brew-time is complete (Fellow recommend appx 4minutes brew-time, but you'll want to experiment). 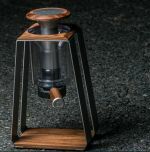 The Duo features an inverted stainless steel cone filter - so no paper filters required.